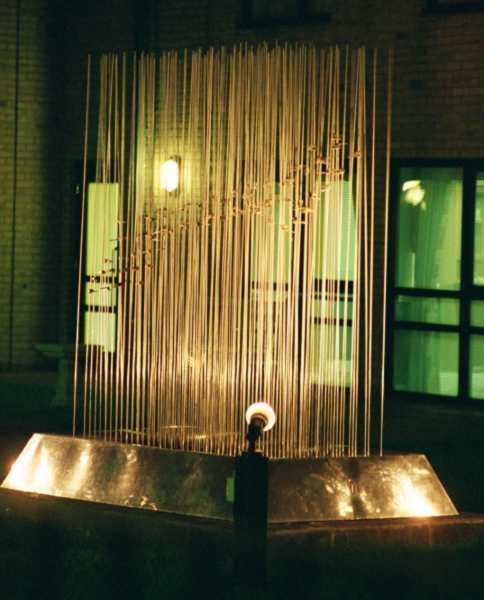 Keyspace - A Kinetic sculpture in East London made from hundreds of car keys in a 3D space. A sculpture commissioned by Housing Justice to highlight the needs of those who are homeless. The piece incorporates keys symbolically provided by churches taking part in Homeless Sunday 2001, and was generously supported by the Key Housing Trust (part of the Shaftesbury Housing Group). Installed in a quadrangle as part of a new sheltered housing development behind Mile End tube station in East London. The construction is from polished stainless steel, the base holding 144 vertical bars which mount a silouette of giant key, the outline is formed from bunches of over 500 brass car & house door keys. The sculpture comes alive with the slightest breeze giving ever-changing patterns of sound & light in a forest of steel. Opened in October 02 by HRH Prince of Wales.